We are fighting an invasion. Actually, two of them, but they're related. First, we have tiny flying bugs that have decided that our kitchen is a fabulous place to hang out. The sink and the pantry are obviously prime party spots for the little devils, so we spent today doing a deep cleaning and getting rid of everything that could possibly attract them. Second, we have an invasion of entitlement. As in our children have decided they are entitled to the things they want and "need". As in K told me I had to buy her more corduroys because all of hers are too small. As in it's my fault that L's dance clothes were still wet when it was time to get dressed for class because I only reminded her a few times to bring them down to get washed. As in L came down and asked when I was going to be done with the vacuum because she was trying to watch TV. As in one major cause for the bug invasion is the dishes that sit in the sink for days because K doesn't think to do the dishes (which is her main chore) without being told. After repeated warnings that have proved to be ineffectual, we're going to try implementing a new incentive plan around here. 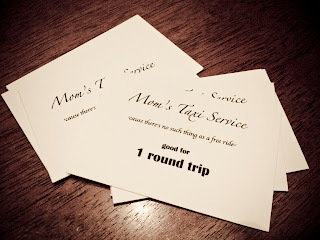 Today I created and printed off a bunch of tickets for Mom's Taxi Service. From now on, whenever a child needs a ride to an activity, they have to have one of these tickets. Got a dance practice? That'll be one ticket, please. Softball game? I need a ticket. Today is band practice? Gotta have a ticket. If I'm not already going there myself, I will charge for the ride. And these tickets have to be earned. Not by some piddly little chore they have to do anyway. After all, their activities take anywhere from 90 minutes to several hours. Earning a ticket requires asking me for a job and completing that job to my satisfaction. Since it will take time to complete each job, they have to think ahead and stockpile a few tickets because if it's time to leave and they don't have a ticket, they don't go. The girls are kinda excited about Mom's Taxi Service. I figure that will last until the first time they have to miss an activity because they don't have a ticket. Today K got her first taste of the new system when I made her clean and vacuum the loft in exchange for a ride to her softball practice tonight. They both are going to need more tickets before this week is out and K is already lined up to make lunch tomorrow so she can earn a ticket to get to her game tomorrow night. We discussed a few other possible jobs tailored to the abilities of the child, like cleaning the bathroom, doing laundry, sorting the big box of socks, cleaning the litter box, etc. I think this will be a good lesson for the girls. If you want something, you have to earn it, and that's a lesson better learned young. Of course, there is the added bonus that it does get a few things off my list. Love this idea!! So great!! I hope it continues to work out well for you!